However, the definition of sustainability on Mordecai Island falls short in light of rising sea levels. Our islands in Barnegat Bay are growing at a rate slightly lower than sea level rise. It follows that sustainability on Mordecai Island must go beyond maintaining status quo. Our projects partner with Mother Nature in order to protect the island from man and sea level rise through leverage. Leverage happens when two or more activities synergize to create growth beyond the norm. It is well known that symbiotic relationships exist between species on our island. Our job is to nudge these relationships along. Ribbed Mussels and Spartina Alterniflora – Ribbed mussels feast on Spartina detritus and Spartina feast on ribbed mussel feces. 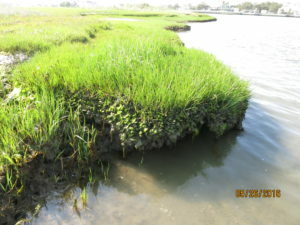 Both grow the saltmarsh. Eelgrass and Bay Scallops – eelgrass is the favorite setting for scallop larvae. 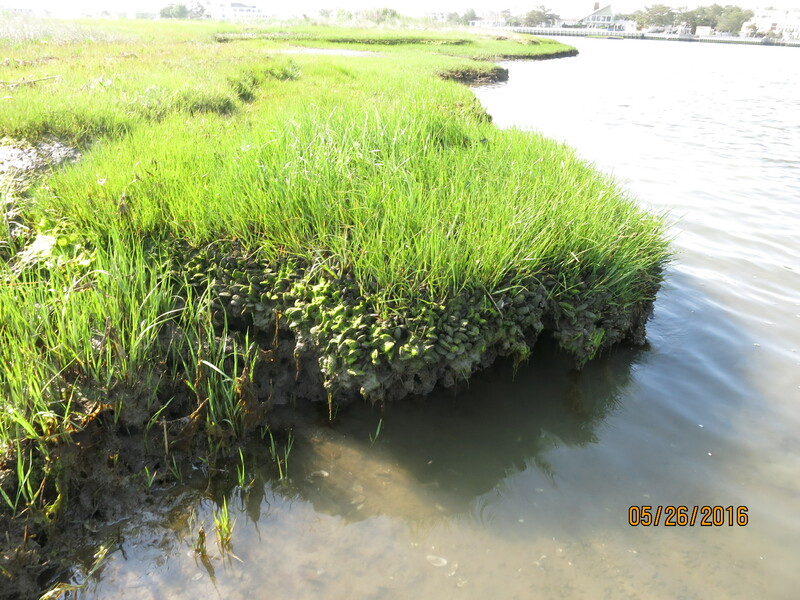 Eelgrass is a keystone species in Barnegat Bay. Eelgrass and Black Skimmers – Eelgrass seeds are a favorite food for Black Skimmers. Diamondback Terrapins and Periwinkles – Our geotubes have created a home for large masses of periwinkles. We recently established diamondback terrapin nests on the island. Periwinkles are one of their favorite foods. Oysters and Ribbed Mussels – Both are filter feeders gobbling up eutrophicating nutrients and other suspended particulates from our bay waters. Oysters grow in the subtidal waters and form the foundation for ribbed mussels which grow at higher elevations. Together they form a living breakwater, attenuating wave forces to prevent shoreline erosion. Beneficial use of dredged material – hurricane sandy caused shoaling in the Intracoastal Waterway adjacent to the island and needed dredging. Many years ago the island was cut in two by a storm. This cut was filled with this material and has since been planted with species native to the island. These are examples of “synergistic sustainability projects” where the interactions of two activities cause additional positive long term results.